Writer Christopher Citro: Other than what I’d hope any reader would, I guess some visual possibilities, what it might look like to leave the earth in a DIY sort of way, images of outer space filtered through an earthbound crankiness. Something that would interest a visual imagination. Plus, I really hoped there’d be a spaceship in it. 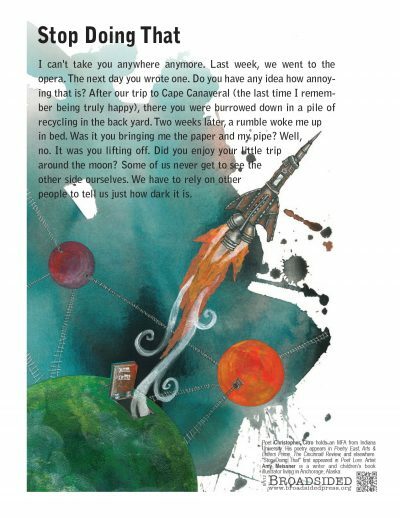 Artist Amy Meissner: The rocket. But mainly I wanted to illustrate a rocket. Writer Christopher Citro: The trapdoors and the ladders strictly speaking aren’t in the poem, and that’s wonderful! It makes the poem-plus-image a new object all its own. The ladders have a real homemade look to them, and the trap doors reflect back upon the poem, perhaps upon the situation of the You, driven to make a spaceship out of refuse just to get away from the poem’s speaker. I hope a reader identifies a little with the speaker, as I certainly do at times, but Amy’s image seems to add to the perspective of the other character, the one heading out. Artist Amy Meissner: My son painted the main watercolor wash when he was 3. He’s now 6. It’s been on the wall for a few years and I wanted to use it as a background for something new. (See, only a terrible mother would PAINT OVER THE TOP of her child’s precious art). He also told me a story about hatches carved into planets and the rockets that fly in and out of them so I wanted to explore this idea as an illustration. Then this amazing poem came along and it seemed like a fine opportunity to get it all going. Now I’m stealing my child’s idea and writing a manuscript for a picture book. See, terrible mother. Writer Christopher Citro: The way the elements I mentioned above made me see the poem in a different way, or at least in a new way I hadn’t before. I’ve spent years with this poem, and I didn’t expect to be able to see it in a fresh way. Also, the way the paint leaves off in splatters and drips along the edges, where a viewer’s eye is drawn by the line of the spaceship, seems to speak back to the speaker’s bitter mood, or at least the mood of the situation these two unfortunates happen to be in. This fits with the idea in the poem that the person returnsto tell the speaker “just how dark it is.” I love that there’s even a rent in the garment of the sky just above the top planet. It’s the speaker’s emotional background to the other character’s foreground Up, up, and away. Artist Amy Meissner: How easily and quickly my smile came. Writer Christopher Citro: You bet! I always write to music which doesn’t have words, usually ambient or jazz, and about half the time I also prop up an art book in front of me, usually photography. I never know what I’m going to write about when I sit down to draft new poems, and a book of photographs helps put me in different moods and also offers me surprising images, situations, and nouns. Otherwise, I might just find myself writing about my mug of Darjeeling, the light along a wall, and my cat. All of which are wonderful subjects, but one wants to branch out now and then. If you had to represent the Broadsided of “Stop Doing That” with one word, what would it be? If “Stop Doing That” were a piece of music, what would it be? Writer Christopher Citro: You bet! Novel-wise, this summer I’ve read Jim Harrison’s recent The Great Leader, Paul Auster’s recent Sunset Park, John Irving’s first novel Setting Free the Bears, and Danuta Borchardt’s new translation of Witold Gombrowicz’s Cosmos. I’m currently three-quarters through James Joyce’s Ulysses, which I’ve always wanted to read. This year, the day before Bloomsday, I decided to have a go. Poetry-wise, it’s been Larry Levis’ The Dollmaker’s Ghost, Mary Ruefle’s Post Meridian, Charles Wright’s Sestets and his Poets on Poetry volume Quarter Notes, and I’m finally reading from cover to cover the collected poems of Richard Hugo, Making Certain It Goes On. I also keep checking out from my local library Matthew Zapruder’s recent book Come On All You Ghosts, then having to return it before I’ve finished. The problem is, I read a poem or two then get so excited I have to go sit down and write my own poems. It’s a stop/start way to read a book of poetry…and it’s wonderful (this process and Matthew Zapruder’s book). Writer Christopher Citro: I moved recently to Syracuse, New York, and The Everson Museum of Art here is fantastic. They specialize in ceramic art, and a recent installation called “A Fired Landscape” by Margie Hughto was amazing. Four walls of a small room were covered with rough ceramic sheets glazed, stacked, folded and burned to suggest different landscapes and seasons, all with the ghosts of plants and flowers actually pressed in. It was a gigantic landscape painting done with clay, with actual landscape. And it smelled great, too. They also had a selection of early video shorts by the photographer William Wegman which had my girlfriend and me rolling off our bean bags laughing. Artist Amy Meissner: I will very soon, as I’m heading to the annual Society of Children’s Book Writers and Illustrator’s conference in LA later this summer. The speakers and the portfolios will be amazing. The rocket is coming along, of course. Writer Christopher Citro: Back in high school I used to make anonymous photocopied collage zines to plaster the school, and in college a friend and I used to fill plastic Easter eggs with one line poems and leave them around town, in classrooms, in the pockets of clothes hanging in stores, in parked cars with their windows open. I am immeasurably proud to know that Amy’s and my collaboration will be posted by Broadsided Vectors in places I couldn’t even imagine. Thank you for allowing me to be a part of this. Artist Amy Meissner: Rockets. More rockets. Writer Christopher Citro‘s poetry appears or is forthcoming in Poetry East, Arts & Letters Prime, Fourteen Hills, Tar River Poetry, The Cincinnati Review, The Cortland Review, Harpur Palate, Faultline, Permafrost, and elsewhere. His poetry has been featured twice on Verse Daily and has been nominated for a Pushcart Prize. His creative nonfiction has appeared in Airplane Reading, and his criticism in The Pittsburgh Post-Gazette and Indiana Review. He won the 2006 Langston Hughes Creative Writing Award in Poetry and holds an MFA in poetry from Indiana University. He can be found online at christophercitro.com. “Stop Doing That” first appeared in Poet Lore.